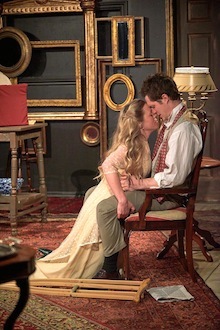 Andrea Mittler’s set for Creditors at the Coal Mine Theatre suggests you’re about to be taken back to a time long ago. It’s a stuffy, old-fashioned world of antiques, all dark wood and bronze. This quaint illusion is completely shattered the moment the action starts, as the story and its characters are far from antiquated. Although it was written over a century ago, August Strindberg’s tragic comedy is still fresh and provocative. Adolph is a young man, an artist, who has recently taken ill. He limps around with the help of crutches, sharing some very private thoughts with a much older man, Gustav. Gustav seems to be genuinely worried about this young man and his attachment to his older wife, a fellow artist—a novelist—named Tekla. Gustav tries to convince Adolph that he has been emasculated by her. Probing the trembling Adolph for details about his marriage, Gustav paints a picture for him—and us—of an older woman leeching off his youthful energy. As we see Adolph grow increasingly unsure of himself and his domestic security, we imagine a treacherous woman who must be confronted for the sake of his self-respect. How shocking for us when Tekla arrives on the scene and we discover she’s a playful, affectionate, and vibrant woman. She’s like a breath of fresh air in an otherwise paranoid, analytical world. We cannot imagine her needing to steal energy from anyone, least of all her once-adoring husband. It is heartbreaking to watch the distrustful, self-conscious Adolph dismantle their relationship. We discover that Gustav has orchestrated this marital disaster for his own sinister reasons. He is a truly destructive character, but his power hinges on the hostile and insecure tendencies in everyone. Tekla and Adolph are not innocent here; they only needed someone to sneak in and set their own defensive instincts in motion. I found myself identifying with all three characters, more often than not, for their less than favourable qualities. Hardee T. Lineham plays Gustav as a mature charmer who has been hardened by heartache. He is, essentially, the villain of the piece, but I found myself touched by his desire to share and justify his own pain. He does this with a calm, logical, Darwinian argument—that people must take power where they can. Liisa Repo-Martell’s Tekla is quietly fierce. With understated dignity, she reveals layers of playfulness and obstinacy that make her as formidable as she is endearing. My heart went out to her when she discovers that her husband, having lost all faith, has become her enemy. The most amusing and unnerving performance—because of its personal relevance to me—was Noah Reid’s Adolph. Simultaneously full of wide-eyed optimism and crippling self-doubt, I saw in his portrayal my own weakness, my own susceptibility to the power of suggestion. He is sensitive and passionate, his heart and mind wide open—a perfect, gaping window of opportunity for some charismatic personality to enchant or destroy him. Director Rae Ellen Bodie has crafted an intense yet restrained atmosphere. The entire play unfolds in real time and no attempt has been made to heighten the mood with lighting or sound effects. The actors carry the full weight of this drama, and it’s breathtaking. My one criticism concerns the very beginning. The play opens mid-conversation, and yet the performers walk onto the stage to get settled before the scene begins. Seeing as this happens after the lights come up and the music has faded out, it gives the impression that it is part of the scene proper, yet it’s clearly just actors taking their places. Why not have them already there and speaking when the lights come up? Regardless, this is a brutal and fascinating play that illustrates just how little human relationships have changed over the past century. Each of us is still our own worst enemy. With genuine humour and grace, Coal Mine Theatre’s production captures the nastiness that lies dormant until our fragile egos have been threatened. I found it immensely entertaining, even while it was striking some raw nerves. Photo of Liisa Repo-Martell and Noah Reid by Michael Cooper. Thank you for your lovely, generous, intelligent and astute review of “Creditors”. Our team has worked hard to bring this together and I’m so pleased that you appreciated our efforts – truly. One thing I did want to mention though concerns your comment re. the top of the play: “Why not have them already there and speaking when the lights come up?” Normally, after the stage goes to black at top of show, the actors are given a cue light to enter in darkness and the scene opens (after the lights come up) with the two of them in mid-conversation – just as you thought it should. Last night the actors didn’t get their cue light so they entered in the light and, well, you know the rest… In short – it was just an opening night glitch. Thanks so much, again, for being there last night.